Yuppies Invading Roosevelt Island - Oh My! While the development of fair-market housing has certainly widened the gap between the 10,000 original residents of what was once dubbed "welfare island" and the occupants of the 1,500 new luxury apartments completed in the past two years, the gentrification of Roosevelt Island has been a gradual process. The island’s much hyped transformation began in 1989, when RIOC green-lit the first market-rate rental development, Manhattan Park, and did not accelerate until RIOC approved two luxury residential complexes in the middle of the past decade—the nine-building Riverwalk development and the Octagon, Becker and Becker’s 500-unit rental development at the site of the former New York City Lunatic Asylum in the Northtown area. Image is from Men Style. UPDATE 2/10/08 - Roosevelt Island affordable housing at Southtown's Riverwalk buildings? It's almost New Year's Eve which brings to a close the year 2007 with the promise and hope of a better 2008 for all. Let's celebrate that wish with a party and a traditional last song from Southside Johnny & the Asbury Jukes together with Bruce Springsteen & the E Street Band at Cleveland's Agora Club from 1978. Lyrics are by Sam Cooke. You Tube video link is here. Who would have thunk it? ? Curbed has awarded Roosevelt Island 2 of its 2007 year end awards for Art & Urbanity. The Encampment came in second place for "Awesomely Absurd Art Project of the Year" behind the Red Hook submarine and ahead of Long Island City's floating tree. might be the finest architectural vision for New York City, and Roosevelt Island in particular, we've ever seen. You must watch it immediately, and this must be built. Make it so. More here on the proposed skyscraper for Southpoint Park. Image is from NY Times. UPDATE: 12/30- According to David Kramer, a principal of the Hudson Companies, the developer together with Related Company of the Riverwalk condos , the New York Observer report is incorrect in respect to the number of condo units sold in this block. The correct number of units sold is 14 not 25. 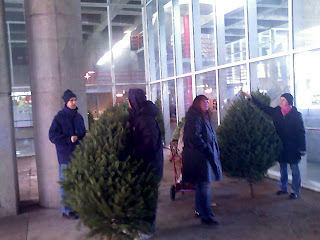 Next Year Holiday or Christmas Tree for Roosevelt Island? Has a tiny little corner of the Cultural Divide concerning Christmas and the other winter seasonal holidays reared it's controversial head here on Roosevelt Island? Is Bill O'Reilly about to champion the cause of re-naming the Roosevelt Island Holiday Tree to Christmas Tree? What is a “holiday tree?” Do you mean Christmas tree? It is very painful to see the “holiday tree” signs all over the Island. As an Islander for over 15 years (more than half my life), I am truly disappointed over the path RIOC is taking regarding Christmas. Is the term “Christmas tree” offensive to some? If so, why should their feeelings be respected while the traditions and beliefs of thousands of Christian Roosevelt Islanders are stepped on and violated? 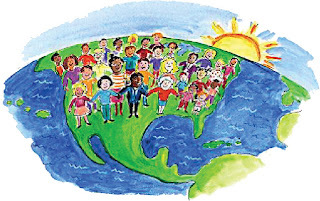 Cultural diversity should not mean putting down certain people in order to please others. I hesitated to post on this topic because there are few if any subjects more divisive than religion in the public square, particularly this time of year, with well meaning and respectful individuals on either side as well as others, unfortunately, who seek to inflame the controversy. I did not see anything positive coming from a post on this subject. The Christmas of parties and presents is far older than the Nativity. Most ancient cultures celebrated the winter solstice, when the sun reaches its lowest point and begins to climb once more in the sky. In ancient Rome, this festival was called the Saturnalia and ran from Dec. 17 to Dec. 24. So for those worried about the First Amendment, there's a very easy way to distinguish between the two Christmases. If it isn't mentioned in the Gospels of Luke and Mark, then it is not part of the Christian holiday. Or we could just change the name of the secular holiday back to what it was 2000 years ago. Some food for thought. Beliefnet, an excellent religion and spiritual web site, has a modest proposal by a catholic priest to move the religious Nativity Christmas to June and let the retailers and consumers have December 25. Via Queens Crap, a Daily News article by the very same John Steele Gordon on How New York Invented Christmas. ... the Puritans outlawed Christmas altogether. When it was revived in 1660, it was a calmer affair, and still celebrated on a community basis. It was New York City that changed all that, pioneering the family — and very child-centered — holiday that has since spread around the world. This is not surprising, perhaps, seeing that Santa Claus is New York's patron saint. No, really. The Dutch ship that brought the first settlers to Manhattan was named for St. Nicholas, the patron saint of old Amsterdam as well as children. It was long a Dutch tradition for children to get presents on St. Nicholas Day, Dec. 6, often put in their shoes or stockings for them to find in the morning. The children of non-Dutch families, noticing how well the Dutch children were making out on Dec. 6, were soon successfully lobbying their parents to give them presents as well. Often these presents came on Christmas instead of St. Nicholas Day. One other point on this topic. I wish people would stop using the word "War" on Christmas. Their is no "War" on Christmas in America. There is a disagreement and dispute over the proper role of the State in celebrating the holiday but there is no war. To use the "War" analogy makes a mockery of the sacrifices made by the service men and women of the United States Military who are fighting and dying in a real global war. State Senator Jose Serrano will be holding constituent office hours on Roosevelt Island the first Tuesday of every month beginning on January 8, 2008. Below is Senator Serrano's announcement regarding Roosevelt Island office hours. * New Years Day is the first Tuesday in January. As a result, constituent hours will be held Tuesday, January 8th. Serrano district office at (212) 828-5829. Also, save this date. Senator Serrano will be holding an Eastwood housing forum on Feb. 7 in conjunction with Eviction Intervention Services and Eastwood Residents Association. Image is a map of the 28th New York State Senate District which includes Roosevelt Island, Yorkville, East Harlem and the South Bronx. Via The Presufer, an Airstream Trailer light show that would fit in very well with Brooklyn's Dyker Heights Christmas extravaganza or the Roosevelt Island Holiday Tree. Here's the Christmas Song sung by the fabulous Nat King Cole. Enjoy! And the Dyker Heights Christmas Lights as fantastic as ever from Gowanus Lounge. Nat King Cole You Tube video link here. And something for those who eat Chinese food on Christmas and go to the movie theater too. A funny satirical video. Chinese Food on Christmas You Tube video link is here. Elvis Costello You tube video link here. Santa Claus has been spotted near the 59th Street Bridge by Bruce Springsteen & the E Street Band. you've better been good for goodness sakes!! You Tube video taken from London concert on December 19, 2007. Here is Classic Bruce Springsteen & E Street Band from 1978 at the Capital Theater in Passaic, New Jersey doing Santa Claus is Coming to Town. You Tube video is here. I remember driving through a blizzard in 1980 to see Bruce in Hartford, CT the night before an important exam. Don't remember much about the exam, but the concert was fantastic. He is simply the BEST live performer in the history of Rock. 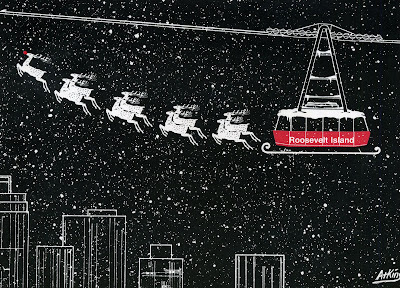 Image of Roosevelt Island Tram being pulled by reindeer is from a card created by local resident who sells them at the Motorgate Atrium. I'm not sure if they are still available but if anyone is still interested in buying a set for this year or next, let me know and I will put you in touch with the seller. A beautiful Irish Fairytale of New York for Christmas time by the Pogues and Kristy MacColl. A great animated version here. decided to stop censoring The Pogues' Fairytale of New York. But what is such unfestive language doing in a song often voted the nation's favourite Christmas tune? 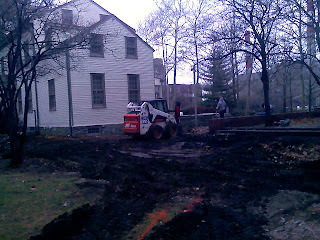 As I was walking by Blackwell House this cold, chilly morning I noticed what appeared to be some landscaping work being done. Roosevelt Island 360 has the answers. 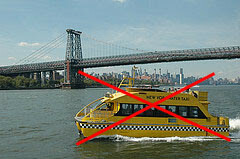 New York Water Taxi regretfully announces the suspension of commuter service on the East River from 1/1/08 to 5/1/08. As you may know, NYWT took over the service in 2003, on short notice, when it was abandoned by another operator. We have added new stops and worked tirelessly to make the run economically viable. This year, for the first time, the service broke even during the spring, summer and fall when tourists used the commuter service for sightseeing and visitors traveling to and from Water Taxi Beach. However, fuel prices have doubled since the beginning of 2007 and during the winter months ridership on the East River commuter service decreases approximately 30%. Therefore, it is not economically viable to operate the service during the winter months. We apologize for the inconvenience that this service suspension will undoubtedly cause. NYWT will resume the service on May 1, 2008. From a practical point of view, ferries and water taxis are of limited appeal to most commuters. They are expensive ($5 each way from Schaefer to Wall Street), and unless you live and work near the waterfront, require another $2 for a subway or bus. The City could make the water taxi a bit more appealing by providing subsidies, or by providing MetroCard transfers to eliminate the double fare hit. Roosevelt Island ferry service is certainly no panacea to our transportation infrastructure problems but it will certainly help, particularly, as speculated by Roosevelt Island 360, in the event of an emergency when both the subway and tram are out of service. Roosevelt Island ferry service could also be a component of an East River ferry commuter service with stops on the Upper East Side, Roosevelt Island, Midtown East, United Nations, Long Island City, Greenpoint, Williamsburg, Dumbo, Wall Street and Red Hook. A well thought out East River Ferry commuter ferry system combining metro card service and public transportation subsidies (here is a 2005 report by Metropolitan Waterfront Alliance on subject) could provide waterfront neighborhoods in Brooklyn, Queens and Manhattan (which includes Roosevelt Island by the way) a transportation option similar to that available to residents of Seattle which has a wonderful commuter ferry service. Seattle even has a ten year ferry passenger strategy report. Imagine that! 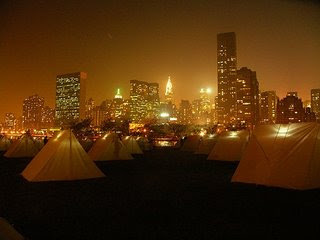 Image is from Brooklyn 11211 via Gowanus Lounge. You Tube video of Sarah McLachlans's River is here. 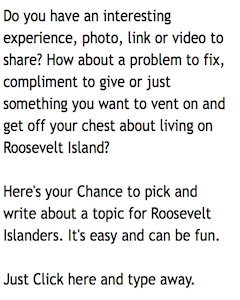 Gowanus Lounge provides an interesting option to the reader who asked about Christmas Day volunteer opportunities on Roosevelt Island. One of the most unique holiday operations in New York City is PortSide New York's Operation Christmas Cheer. 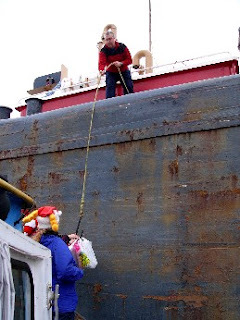 It involves visits to dozens of working tug and barges on Christmas Day and the distribution of cookies, newspapers and cheer to the crews. This is the fourth year that PortSide is spreading joy around New York Harbor. breathe life into the relationship between landside communities and the maritime sector—to the advantage of both. ...create activities and spaces that benefit both groups, nurture economic connections between the two, foster their mutual appreciation, and make the waterfront neighborhood they share a better place to live, work and visit. Although not a land based volunteer opportunity many of these tug and barge crews probably work the East River and often pass by Roosevelt Island. Image is from PortSide New York Operation Christmas Cheer. UPDATE 12/22/08 - Here's an update on volunteering opportunities for 2008 at Coler-Goldwater Hospital. It's Christmas Time in New York City. Enjoy a walk through Rockefeller Center and Bryant Park while listening to John Denver's version of Silver Bells. For me, a nice coating of snow in Central Park will make it seem more like Christmas. You Tube video of John Denver version is here. You Tube video of Twisted Sister version is here. Several evenings ago I was rushing up the the Tramway steps at the Second Avenue station trying to catch the Tram before it left for the trip back to Roosevelt Island when I noticed a woman bouncing a stroller with a baby in it passing me going down the stairs. She was clearly having some difficulty but I kept rushing up the stairs to get the Tram before it left the station. I was tired and wanted to get home. I took a couple of more steps up the stairs still hearing the clacking sound of the stroller going down the stairs. Fearing that the woman would lose control of the stroller tossing the baby down the stairs I stopped, turned around and helped the women carry the stroller down the rest of the stairs. Not a big deal but a very small, simple act of kindness. This incident reminded me of the TV commercial showing strangers helping other strangers that in turn inspires still others to do the same. Some may think the commercial lame or cynical. I thought it was great. You Tube video link of commercial is here. Perhaps those seeking to demolish Coler-Goldwater's south campus and replace it with more luxury condos should consider, at least for a moment, what will happen to the residents of the hospital. It all begins with a simple act of kindness. Audio recording of Senator Kennedy's speech is here. The Charlie Brown Christmas Television show was always a happy occasion at my house growing up so since it is beginning to look alot like Christmas I thought it would be fun to watch this You Tube video. Here is a special treat. A link to the entire Charlie Brown Christmas show which was named one of the 100 best all Time TV shows. Governors Island Says No Way to Louis Kahn/FDR Memorial! Why Can't Roosevelt Island Residents Do Same? Apparently Governors Island does not want the Louis Kahn memorial either. I attended a recent meeting concerning the NYC waterfront. At the meeting were representatives of waterfront neighborhoods, City planners, public officials and others interested in the future development of NYC's waterfront. I had a conversation with a representative of the Governors Island Preservation and Education Corporation (GIPEC) about the proposed Louis Kahn/FDR memorial and asked that person's opinion on whether GIPEC would be interested in including the Kahn memorial in the plans for Governors Island. The response was that there was NO WAY they wanted that thing on Governors Island and that the 1970's concrete and granite design was not appropriate for a modern park. So I ask again. Why does Roosevelt Island get stuck with the Louis Kahn/FDR memorial for Southpoint Park instead of the Trust for the Public Land's Wild Gardens/Green Rooms plan that is favored by the residents of Roosevelt Island and that retains these fantastic views that will be blocked by the Kahn design? One of the arguements made in favor ot the Louis Kahn design by its advocates is that some sort of committment or binding obligation had been made by New York State to have it built. However, there is no mention at all of the Louis Kahn design in the Roosevelt Island General Development Plan (GDP) but there is a specific mention of a park at Southpoint. Had there in fact been such a committment for the Kahn memorial it would have been included in the GDP which outlines the approved development of Roosevelt Island. Since the Kahn design is not in the GDP please stop making such arguments. 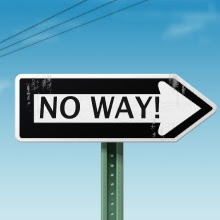 Image of No Way sign is from Image Chef. Governors Island image is from GIPEC. Image of Louis Kahn/FDR memorial is from Architectural Record. 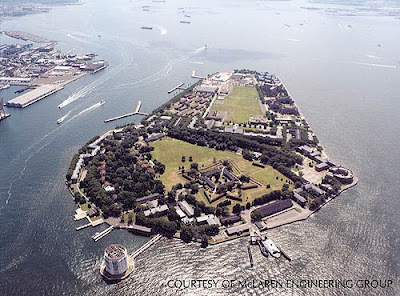 The design, commissioned by the Governors Island Preservation and Education Corporation, calls for transforming much of the flat, sober island, which is roughly a half-mile from Lower Manhattan, into green space. That includes a two-mile promenade at the water’s edge, a new park on the southern flat expanse of landfill — where abandoned Coast Guard buildings are to be demolished — and an improved park in the island’s northern historic district. 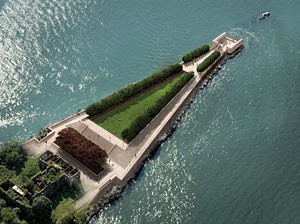 The architects proposed using the detritus from the buildings that are to be destroyed to form hills that would exploit the island’s views, which include the Statue of Liberty. Gee, doesn't that sound like the Trust for the Public Land's Wild Gardens/Green Rooms design for Roosevelt Island's Southpoint Park? I don't see any concrete or granite memorial for Governors Island Park but that is what is planned for Roosevelt Island's Southpoint Park. Chapter 889 of the New York State Unconsolidated Laws of 1984 is the stature that authorized the creation of the Roosevelt Island Operating Corporation (RIOC) as a New York public benefit corporation with the power to plan, develop, operate, maintain and manage Roosevelt Island. Essentially it is the governing document for Roosevelt Island and together with the Roosevelt Island General Development Plan and the Master Lease between the City and State of NY controls the fate of Roosevelt Island. Recently, RIOC provided copies of the General Development Plan and the Master Lease which are now available for any Roosevelt Island resident to view online. Thanks to the efforts of State Senator Jose Serrano and his staff, Chapter 889, the Roosevelt Island governing statute, is now online as well. 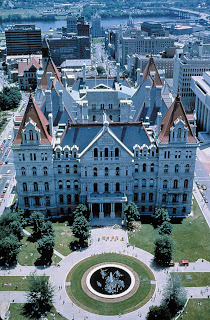 Image is of the New York State Capital. A reader sends in this question seeking places to volunteer on Christmas Day. Any ideas? Do you know of any Christmas Day volunteering opportunities on Roosevelt Island, perhaps at the senior center? Any info you could give (including pointing me in the direction of others who may know) would be wonderful. 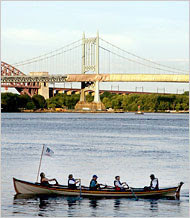 Here is a link to Roosevelt Island charities from Charity Guide that may be of help. 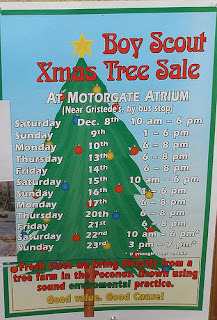 The Roosevelt Island Boy Scout Troop is conducting their annual Christmas Tree Sale at the Motorgate Atrium. 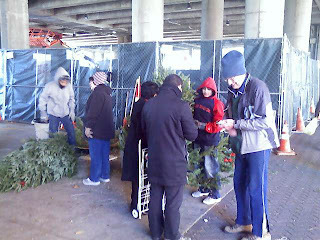 If you are in the market for a Christmas Tree this week why don't you stop by, pick out a tree and support the local Roosevelt Island Boy Scout troop. 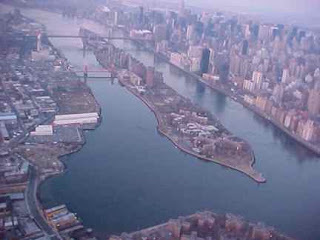 Image below is from Roosevelt Island 360. 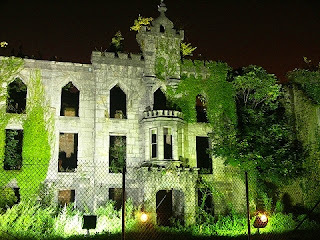 Roosevelt Island Dilapidated Renwick Ruins - A Metaphor for the Republican Party? Every night on New York City's Roosevelt Island, someone pays to have lights shoot up at the Renwick Ruin [photo gallery, vid]. It was designed by the man, James Renwick, Jr., who designed St. Patrick's Cathedral, and now it is a dilapidated shell, illuminated at night for all to see. "See what's become of me!" It's what we risk, should our current intra-party animus linger. On the Democatic Party side, what Roosevelt Island analogy applies to Senator Barack Obama? Perhaps the hope and promise of the new Wild Gardens/Green Rooms Waterfront Park at Southpoint Park proposed by the Trust for the Public Land and favored by Roosevelt Island residents over the outmoded, environmentally challenged, 1970's design of the Louis Kahn/FDR memorial that will obstruct these fantastic views of the East River Waterfront and NYC skyline? Then what Roosevelt Island metaphor applies to Hillary? Image of Republican candidates is from MSNBC. Image of Renwick Ruins is from Weblicist of Manhattan. Sir Arthur C. Clarke, a science-fiction author, inventor, and futurist, simply a greate mind celebrates his 90th birth anniversary on 16th of December, 2007. Sir Arthur was the first person to propose using geostationary satellites for instant global communications. An ``artificial satellite'' at the correct distance from the earth would make one revolution every 24 hours; i.e., it would remain stationary above the same spot and would be within optical range of nearly half the earth's surface. Three repeater stations, 120 degrees apart in the correct orbit, could give television and microwave coverage to the entire planet." He is the author of many books including 2001: A Space Odyssey, Childhood's End, Rendezvous With Rama and my favorite Clarke book, Fountains of Paradise that describes the construction of a space elevator. 1- When a distinguished but elderly scientist states that something is possible, he is almost certainly right. When he states that something is impossible, he is very probably wrong. 2- The only way of discovering the limits of the possible is to venture a little way past them into the impossible. 3- Any sufficiently advanced technology is indistinguishable from magic. Happy 90 orbits around the sun Sir Arthur. Transcript and video of Arthur C. Clarke's 90th birthday remarks are here. UPDATE 12/16/07: For those interested in space and astronomy, today's Washington Post has a fantastic profile of Neil deGrasse Tyson, the Director of the Hayden Planetarium. "I grew up in the Bronx, and I'd never been in total darkness before," he says. "The closest you'll get is a movie theater, but even in a movie theater there's a glow from the doors. So I had a kind of urban view of the universe, and when I was at the planetarium and the stars came up, I remember thinking, 'Nice show, but this is not the real universe. I've seen the real universe, and it has 12 stars in it.' " Once Tyson learned otherwise, he was smitten. He'd talk about the universe, read about the universe and, whenever possible, stare at the universe through a telescope he'd lug to the roof of the apartment building where his family lived. Whenever anyone asked what he'd do when he grew up, he had an answer, one that he had trouble pronouncing at the time: "I'm going to be an astrophysicist." Which is what he became, though his PhD in the subject is but one line of a résumé so packed with titles and achievements that it is tiring to read. Tyson is the author of eight books on all things intergalactic, most recently "Death by Black Hole: And Other Cosmic Quandaries," a bestseller that was just released in paperback. He is also the host of "Nova ScienceNow," a "60 Minutes"-style show on PBS, as well as a lecturer, researcher and a TV pundit whenever the heavens make news. I don't think Arthur C. Clarke would mind sharing his birthday message with Neil deGrasse Tyson. Just received this email from Congresswoman Maloney's office stating that the US Army Corps of Engineers has approved permit application for construction of Ferry Dock at Roosevelt Island. I will find out what else needs to be done in order to finally get East River ferry service to Roosevelt Island. Congresswoman Carolyn B. Maloney (D-Roosevelt Island, Manhattan, Queens) announced today that the United States Army Corps of Engineers (ACE) has approved the permit application of Octagon LP to construct a water taxi dock on Roosevelt Island. Representative Maloney, who urged the federal agency to render a decision on the water dock permit application in order to improve transportation options for local residents, noted that water taxi service will increase Roosevelt Island’s accessibility and security. "I am pleased that Army Corps of Engineers has chosen to increase the safety and convenience of Roosevelt Island residents by granting approval to construct this water taxi dock,” said Congresswoman Maloney. "It is a good day when government agencies, private companies, and elected officials can work together in the public interest to improve the quality of life for those whom we serve. With Roosevelt Island residents struggling to board overcrowded subway trains during morning rush hour and the prospect of temporarily losing Tram service while it is rehabilitated, providing other transportation options becomes even more critical,” she said. Congresswoman Maloney also vowed to continue to work closely with public and private sector leaders to ensure that water taxi service becomes a reality for Roosevelt Islanders. On September 21, 2007, Congresswoman Maloney wrote to Commander Robert L. Van Antwerp of ACE to press the federal agency to render a decision on the long-pending application submitted by Octagon LP to construct the water taxi dock. The application was initially filed more than a year and a half ago seeking a permit to construct a dock near Octagon Park on the northern end of Roosevelt Island. “The water taxi would provide alternative routes to Manhattan for residents of Roosevelt Island,” wrote Representative Maloney in her letter. Representative Maloney has been a vigorous and effective advocate for her constituents on Roosevelt Island since her election to Congress. 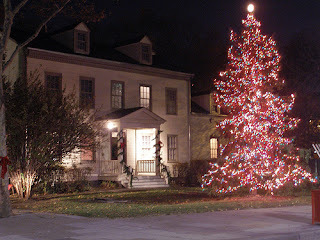 In 2002, she worked with the Roosevelt Island Operating Corporation to help secure a $250,000 matching grant from the New York State Office of Parks, Recreation & Historical Preservation to repair and restore one of the Island’s notable landmarks, Blackwell House. After the subway station was built on Roosevelt Island, Rep. Maloney secured $700,000 in federal highway funds to install surveillance cameras in the station to provide better security. She also successfully urged ACE to undertake the $500,000 study documenting failings in the Island’s Seawall. Congresswoman Maloney has also consistently been involved with a range of other issues affecting Roosevelt Island, including fighting for better policing and successfully fighting for the reopening of the Tramway following suggestions from some quarters in the wake of the April 2006 breakdown in service that it be mothballed in perpetuity. She continues to work closely with her fellow elected officials representing Roosevelt Island to present a forceful and united voice for its residents. Good job by Congresswomen Maloney. Roosevelt Island 360 has more here. We've been in discussions with New York Water Taxi for the last three years about bringing service to Roosevelt Island and adding our stop to planned routes up the East River. When service is established we expect to have service running to 34th Street and Wall Street. Eventually we hope there are many more options. Battle Between Buyers and Sellers Is Not a Life and Death Struggle - But This Is! Buyers and sellers alike are indeed digging in their heels. Having said that, I'm seeing more motivated sellers on the market right now than those who "test" the market to see if they can get their price (inflated usually). I have also experienced many sellers pulling property off of the market as they have made the decision to stay where they are and "ride out the storm." If there is going to be a storm, and that remains to be seen, then perhaps this is the calm that precedes it? So what do I see happening in 2008? Based on the plethora of economic data that I have been watching, certain segments of the Manhattan market may see the current imbalance of inventory and buyers tip slightly more toward the buyer's favor. Now, brokers say, they see a stalemate developing between buyers and sellers in Manhattan, especially for apartments in the $1 million to $5 million range. Remember, though certainly an important factor, the residential real estate market does not rise to the level of life and death. Keep your perspective. This is a life and death struggle that has had over 20 million views on You Tube. The Battle at Kruger is simply an amazing sight to watch. Do yourselves a favor and watch the entire video which is a little more than 8 minutes. It will be worth it. My question is, who does the Lion and Buffalo represent - the Buyer or Seller? We know the crocodile is the broker. While natives remain wary about real estate and worry about bonuses and the economic climate, foreign tourists are keeping brokers busy with their eagerness to buy up Manhattan apartments, which many see as investments. As regular readers of Roosevelt Islander can probably tell, the banner at the top of the blog depicting the Roosevelt Island Tram is considerably smaller than usual. This is because of a system wide problem with the Blogger code that has caused banner images to become truncated and distorted. I hope to have this problem fixed soon. I am not very happy right now! Image is from Blog Way Baby. UPDATE - Image has been restored to proper size but Roosevelt Islander Blog Title is not working properly. Still trying to fix. UPDATE - 12/22/- Image size and Roosevelt Islander title have now been restored. 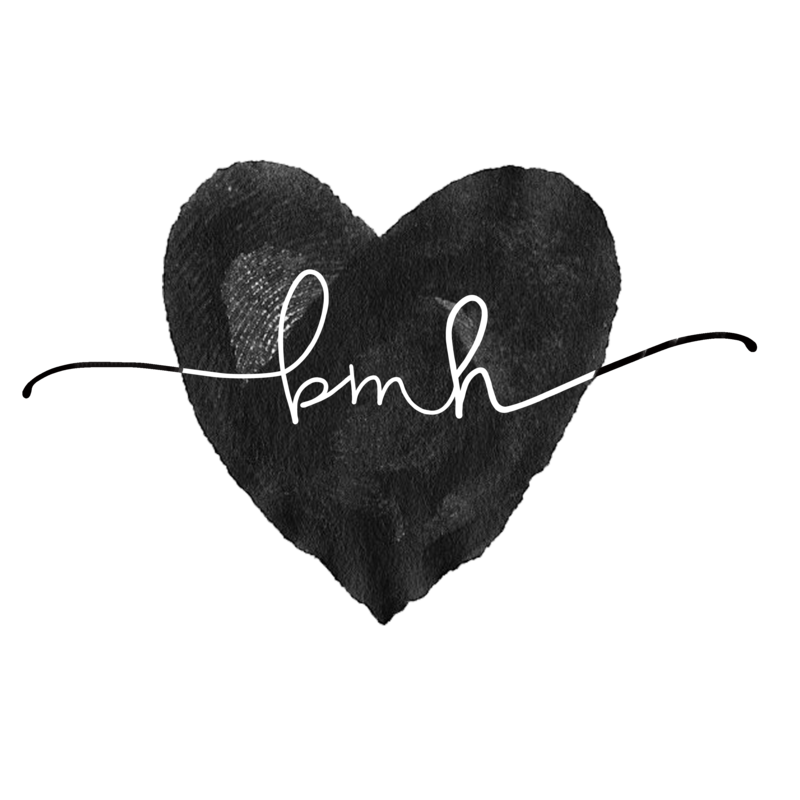 A big thank you to the Blogger help group that made this correction possible. 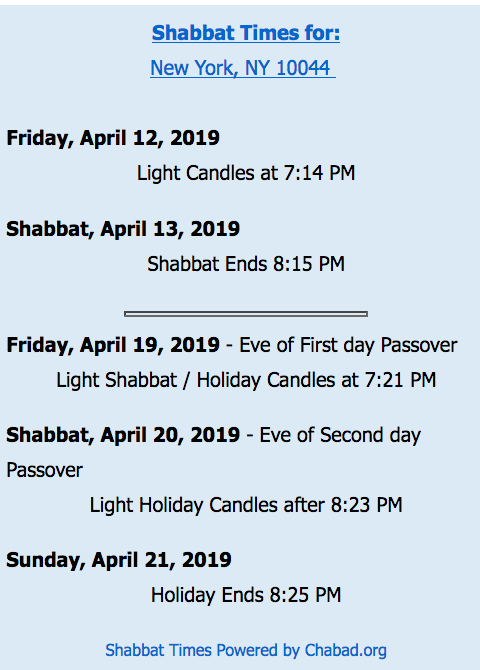 RIOC's Upcoming Events page provides the following information. Participate in this years US Marine Corp Toys for Tots program. IT'S VERY EASY: SIMPLY BRING A NEW, UNWRAPPED TOY AND DROP IT IN ONE OF THE COLLECTION BOXES. The Marines will be returning on December 21st to collect the boxes and distribute them to charitable organizations, houses of worship, foster homes, shelters, etc. in the NY metropolitan area. Free snacks, refreshments & lots of good information on recycling, water conservation, energy efficiency, and more! Roosevelt Island 360 has more on weekend events. ... it would be of great use to the community if other important Roosevelt Island governing documents such as the General Development Plan and all Amendments thereto be made available to the public. Thanks to RIOC President Steve Shane, the Roosevelt Island General Development Plan and the 1969 Roosevelt Island Master Lease between the City of New York (Lessor) and the NY State Urban Development Corporation (Lessee) and Welfare Island Development Corporation (Subsidiary) are now available online for review by all who may be interested. A permanent link will be on the right side column under the title Roosevelt Island Governing Documents. The biggest hurdle agencies face in sharing information with one another and with citizens is not the technology but rather how the agencies organize information, said Karen Evans, who oversees the e-government program for the Office of Management and Budget. The operation and management of RIOC has exhibited, in the past, a pattern of secrecy and unaccountability consistent with what the Committee has found at other authorities. With respect to relations with the Island's community and institutions, including matters such as open meetings, FOIL requests, public participation and RIOC activities and full public disclosure of important public issues, RIOC must show significant improvement. Certainly RIOC operations have begun to change for the better here on Roosevelt Island. If anyone has any suggestions for additional information or documents concerning Roosevelt Island to be made publicly available please let me know and I will try and get it. Good job by RIOC in providing citizen access to these essential Roosevelt Island governing documents. 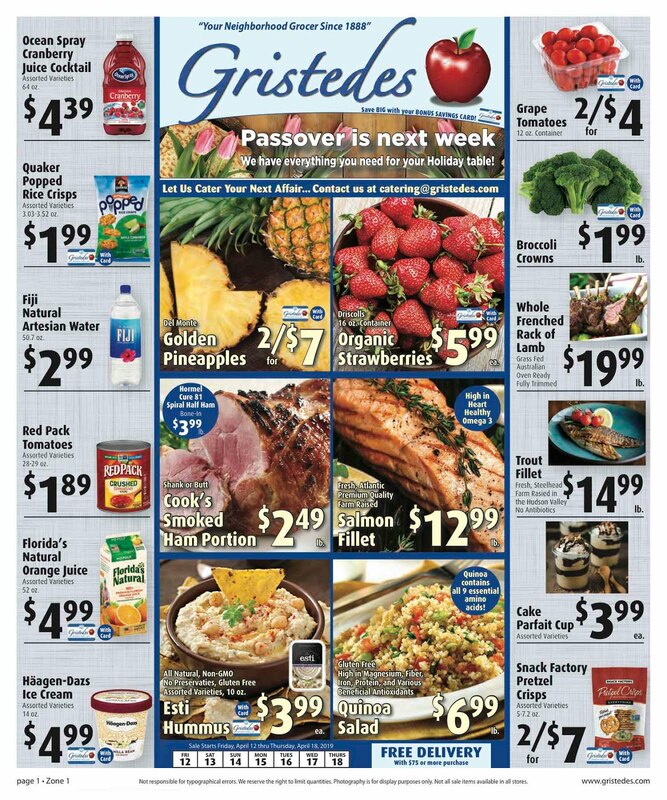 Image is from Inman News. The Berlin Wall is Falling for Roosevelt Island Retail!!! "It looks like East Berlin before the wall fell," said Andrew Oliver, executive vice president of Cushman & Wakefield Sonnenblick Goldman. For years, there was only one chain store, a Gristedes grocery, and much of the remaining retail was service-oriented: a diner, a Chinese takeout joint and a thrift shop, among others. As a result of the limited retail options, the arrival of seven store spaces in the new Riverwalk buildings -- Buildings 3 and 4, also known as Riverwalk Place and Riverwalk Landing, respectively -- is a big deal to area residents. David Kramer, a principal with Hudson, noted that the island's location and limited transportation options will never make it a destination for shoppers, but he said that six of the seven retail spaces in the new development have been leased out. Along with Starbucks and Duane Reade are a salon and a dry cleaner, and two restaurants: Fuji East and Nonno's Focacceria. The seventh space has yet to be filled, but Kramer said the developers are looking to bring a food store into the space. The retail rents for the new Roosevelt Island buildings have been hovering in the $40 to $45 a square foot range, he said. With the fall of Roosevelt Island's Berlin Wall, is Riverwalk developer David Kramer Roosevelt Island's Mikhail Gorbachev? ... below the 59th Street Bridge, is a no-man's-land of old warehouses, currently being debated as the site of future parkland or residential development. ...Riverwalk's fifth building, a 123-unit condominium building known as Riverwalk Court, opened for sales on Oct. 24. The units are priced around $850 a square foot, Kramer said. There is no "no-man's land of warehouses" on Roosevelt Island below the 59th Street Bridge or anywhere else on Roosevelt Island. Only the south campus of Coler-Goldwater hospital, the Tennis Bubble, Sportspark and Southpoint Park that certainly can't be mistaken for "warehouses". Also, the Riverwalk Court condominium units did not go on sale in October. Sales are just about to begin now in December. Slideshow is from Roosevelt Island 360. It shows the available retail space at Hudson/Related's Riverwalk development. and the Voices of Liberty, an eight part a cappella group performing at EPCOT in Walt Disney World. Matisyahu You Tube video link is here. Voices of Liberty You Tube video link is here. Why Is Roosevelt Island the Way It Is? ...operations, its compliance with the terms of the Island's 1969 master lease with New York City, the Island's official owner, and in particular, the selection and appointment of its senior staff, their qualifications and job responsibilities and performance..."
that for a number of years the effective operation and management of RIOC was compromised by secrecy, political patronage, a lack of long-term financial planning, and questionable fiscal policies. It is clear, however, that in many areas, past mistakes have been acknowledged and corrective steps have begun to be taken. New staff appointed by the Governor and working with the Board has begun to change RIOC's management culture by ending the policy of one-time payments, making public long-term financial planning documents, and acknowledging the need for greater transparency and accountability. The new staff referred to applies to the administration immediately preceding the current one. The study covered the period of time prior to the current administration under Governor Spitzer and RIOC President Shane and does not reflect at all upon their management of Roosevelt Island. The Assembly Committee study does provide some valuable background information regarding the early development of Roosevelt Island. The GDP delineates the design of the Island and controls its development.4 Roosevelt Island is divided into two principal areas: Northtown and Southtown.5 Northtown and Southtown are separated by Blackwell Park, which is approximately 3.8 acres.6 The GDP specifically called for about 5,500 units (the number of units currently proposed is 5,758 units) of subsidized, middle-income and conventionally financed housing, 20,000 square feet of office space, 100,000 square feet of commercial space, and certain public facilities, including a school for 2,000 children, a library, community rooms, children's day care centers, swimming pools and facilities for the elderly. The GDP requires Northtown to contain 60% of the housing, commercial facilities, child care, recreational facilities and the preservation of the Chapel of the Good Shepherd.7 The GDP requires that Southtown contain 40% of the Island housing, a swimming pool, a library, the schools and a Town Center.8 The GDP also requires that certain areas of the Island be designated open spaces including: Lighthouse Park, Octagon Park, Blackwell Park and other areas that were to be linked with pedestrian paths and walkways.9 UDC completed Northtown in 1977. It is comprised of four Mitchell-Lama buildings, of which one is a limited equity co-op, consisting of 2,200 units. Manhattan Park, considered an extension of Northtown, followed in the late 1980s. Manhattan Park is a 1,100 unit market-rate rental building and section VIII housing units. However, due to fiscal constraints, UDC could not complete the development of the Island. Therefore, in 1984 the Roosevelt Island Operating Corporation, a public benefit corporation, was created to operate and manage Roosevelt Island.10 At the time of creation, RIOC assumed all responsibilities, rights and obligations including the agreement to pay the City rent for the use of the land.11 However, to this date, RIOC has never paid any rent to the City. In 1999 RIOC approved Hudson Companies and Related Companies ("Hudson & Related") as the projects' developers for Southtown. Hudson & Related were chosen to develop Phase 1 (four buildings with about 900 units) and Phase 2 (five buildings with 1100 units). RIOC received a one-time payment of about $6 million for the first two buildings of Phase 1. Building 1 was sold to Memorial Sloan-Kettering;17 building 2 was sold to Cornell University.18 Both are used for staff housing. Building 3 is currently under construction as a market rate condominium, with RIOC receiving about $2.17 million. Building 4 is not yet under construction and will be used for rental housing. Image is from Forgotten New York. State Senator Jose Serrano provides the following information for Roosevelt Island organizations seeking funding for their projects. 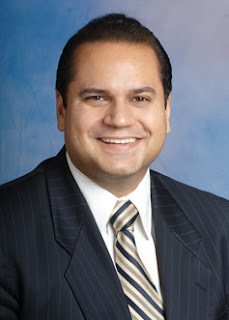 Senator Serrano remains one of the few state legislators to release his list of legislative grants in a timely and accessible fashion. As part of that commitment to transparency and accountability, the Senator wants to ensure that every organization working in the 28th District is aware of grant opportunities through his office. Among Roosevelt Island community groups receiving funding in the past are the Roosevelt Island Historical Society ($5,000) and the Roosevelt Island Visual Arts Association ($8,000). The deadline for grant applications is February 15, 2008. If your organization is seeking funding, here is an application form and list of previous grant recipients. Good job by Senator Serrano in making this infomation widely available to his Roosevelt Island and other 28th Senatorial District constituents. Who will be the new Public Safety Director? How does one get to occupy that post? Is he or she appointed by the RIOC? applicants will bear on the selection process. 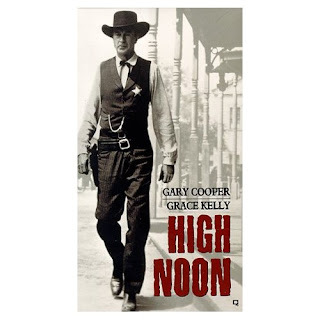 Image of another type of Public Safety Director, Gary Cooper from the movie High Noon, is from Amazon. You Tube video clip from High Noon is here. The Columbia Spectator (Columbia University's student newspaper) has an article today on one of Columbia's and New York City's most generous philanthropists, George T. Delacorte. Among his contributions to New York City Parks are Central Park's Alice in Wonderland Statue, the Central Park Zoo's Delacorte Clock and the Delacorte Theater, the site of the Shakespeare in the Park summer series. But of all his contributions, his own favorite remained the Delacorte geyser at the tip of Roosevelt Island. He and his wife called it "Delacorte's Folly." 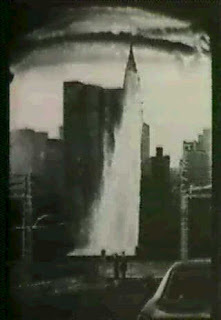 In 1969, Mr. Delacorte conceived the idea that New York should have a geyser equal to the Jet D'Eau in Lake Geneva, Switzerland. His geyser, at 400 feet, was to be the highest fountain in the world, but many New Yorkers were outraged that, when built, the $350,000 jet spewed polluted East River water into the air. He was forced to chlorinate the fountain. Then the chlorination withered trees that Sutton Place residents had placed on the island to improve their view. Mr. Delacorte was more annoyed than moved by the complaints. He said his fountain was there before the trees. In an editorial when the fountain was installed, The New York Times, citing the city's crucial needs and noting that the money might have been put to better use instead of being thrown "literally down the drain," called him "the wrong-way Corrigan of New York philanthropy." the Delacorte geyser pumped a graceful plume of East River water hundreds of feet skyward from Roosevelt Island four times a day. ''liquid waste was being flung 400 feet in the eyes and faces of people who lived on Sutton Place.'' The water was subsequently chlorinated (and, if it's any comfort, whatever was flung by the fountain more recently only reached about 240 feet high because of equipment problems). Later, during the drought years, city officials expressed concern the geyser might be regarded as a symbol of conspicuous consumption - even though the water, most of which fell back into the East River, was unlikely to be consumed by anybody. The fountain was turned off. (Similar concerns were expressed when energy conservation was in vogue; the electric bill, some $10,000 a month, was paid by the city). The Geyser finally stopped working in 1987 because of a faulty valve and never repaired. 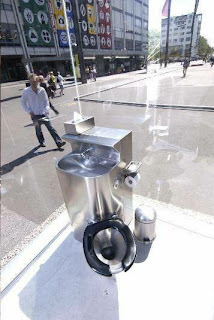 Delacorte was ahead of his time in seeing the beauty of Water Geysers in an urban or city setting. Take a look at this You Tube video of the Water Fountain show at the Bellagio Hotel in Las Vegas. Pretty Neat! Wouldn't a similar show in the East River be spectacular. Top image of Delacorte Geyser is by artist Judy Seigel from ArtNet. Bottom image is from Timeline of Roosevelt Island History. service and we shall more publicly acknowledge it in the weeks ahead.